Click on the DONATE button below to contribute to our P.T.A Dragon Fund. 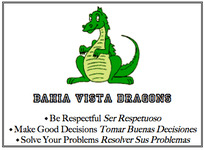 Bahia Vista Elementary PTA is a registered, non-profit association. Click here for monthly breakfast & lunch menus. Bahia Vista/Heads Up Rockin' Run!!! to our community partners for your support. *Wednesday: 8:10 a.m.- 1:20 p.m.
*Wednesday: 8:10 a.m.- 1:25 p.m.
School tours are available year round. If you would like to schedule a tour, please contact the main office at: 415-485-2415. As a reminder your child must be 5 years of age by September 1, 2018 in order to enter Kindergarten for the 2018-2019 school year. Durante el año escolar padres de familia pueden visitar nuestras instalciones de la escuela. Si desea programar una visita, por favor llame a la oficina al: 415-485-2415. Recuerden que si su hijo(a) comenzará el Kinder en el año escolar que viene, tiene que cumplir 5 años de edad antes del 1 de septiembre 2018 para matricularse para el año escolar 2018-2019. ¡Gracias HEADS UP por Apoyando a Nuestras Escuelas! Click on the logo to learn more about how HeadsUp, the foundation for San Rafael City Schools, supports our students!